SCVHistory.com LW2752 | Del Valle Family | Ygnacio del Valle Family Tree. Family tree showing descendants of Ygnacio del Valle, one of seven children of Mexican Army Lt. Antonio del Valle, who in 1839 received the Rancho San Francisco (western Santa Clarita Valley) as a land grant. Upon Antonio's death two years later, the ranch was divided among his widow and children. Son Ygnacio ended up with the western portion, which was already known as Camulos (it had been a sheep ranch during Spanish mission days). Despite hard times in the 1860s when the Del Valles were over-mortgaged and ultimately lost the rest of the Rancho San Francisco, the Camulos section stayed in the Del Valle family until 1924, when Ygnacio's heirs sold it to August Rübel. 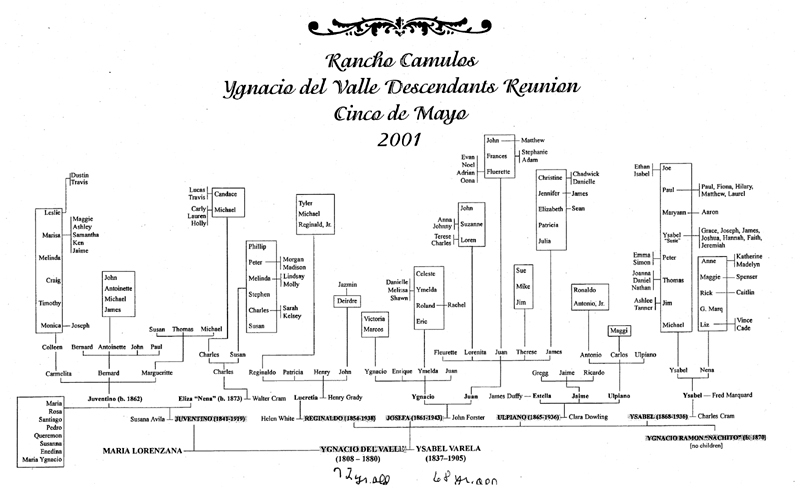 The family tree was compiled for a Del Valle family reunion on May 5, 2001, which coincided with the dedication of Rancho Camulos as a National Historic Landmark. We're aware this family tree contains a few errors in the later generations, but we don't know what the errors are. Once we do, this version will be corrected or replaced. In the meantime, it should be used only as a quick reference for the earlier generations. LW2752: 19200 dpi jpeg from .pdf courtesy of Karen Roswell and RanchoCamulos.org.